Scooter the cat is paralyzed. But that doesn't stop her from scooting up the stairs. The determined rescue kitty makes her latest attempt in a new Instagram video — and her resilience is honestly pretty incredible. Some cats are born disabled, other have suffered accidents or the degenerative effects of old age. A disabled cat can still lead a full and enjoyable life, given a chance and an understanding owner. Cats adapt their lifestyles to cope with disability far more easily than do most humans - this is because they are often willing to spend much of their time resting! This article gives guidelines on caring for a disabled cat. Just as the cat must adapt to its limitations, you will have to adapt your attitude and your home to accommodate its needs. In addition to adaptive changes in the brain and muscles, cats use their intelligence to cope with disability. A cat with mobility problems can often be watched figuring out the best route onto or off of a shelf - it might figure out a route where it can get onto the shelf in a series of steps with little jumps, rather than a single leap. A disabled cat still requires some semblance of independence to allow it to fulfil that inner 'catness' that we love in our feline friends. Most seem unaware of their disabilities and they do not expect life to make allowances, but a helping hand and some adjustments to their lifestyle and perhaps your own lifestyle will ensure a disabled cat has a healthy, happy and safe life. 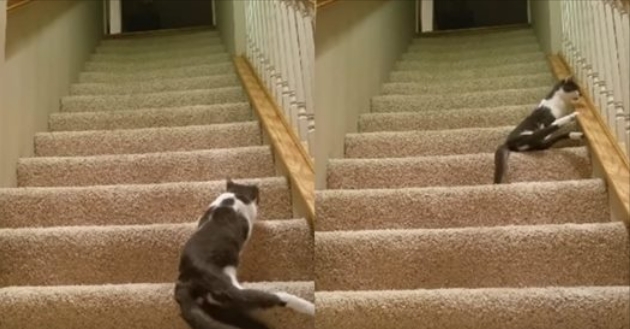 Responses to "Determined Rescue Cat Will Climb The Stairs No Matter What It Takes"